Located along the western edge of Memorial Plaza, 4 World Trade Center by Maki and Associates is part of the Studio Libeskind master plan for the World Trade Center being developed by Silverstein Properties. 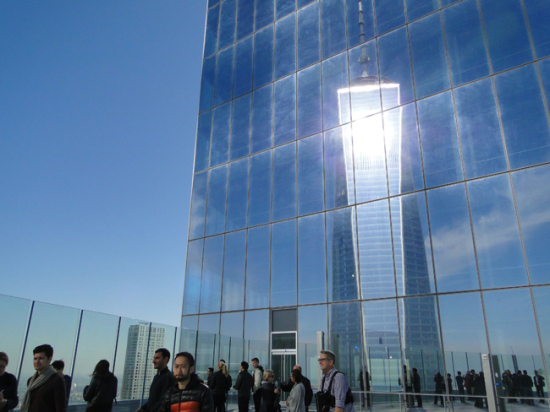 This weekend, Archtober crowds toured the building. 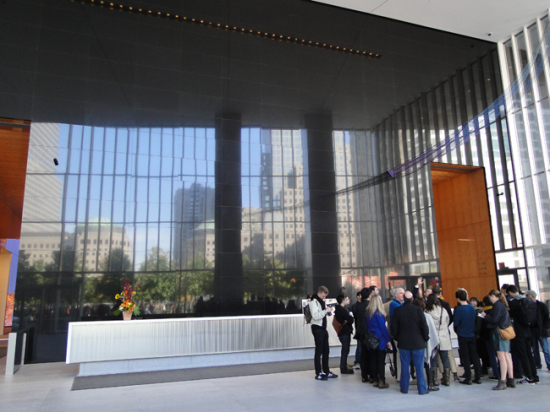 The materials used throughout 4WTC bring the outside in—a black, polished Swedish granite wall brings a reference to the Memorial Plaza into the building’s lobby. The high feldspar content of the granite creates a stippling effect that softens and slightly abstracts this reflection. 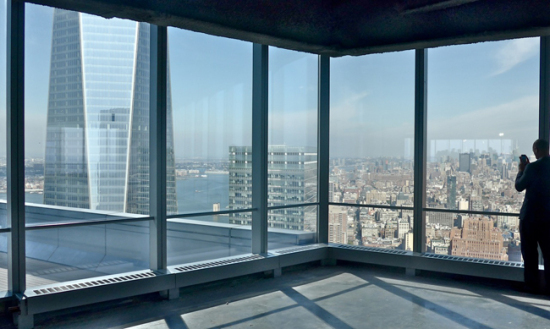 The glass used in the first-floor lobby is low in iron, rendering it incredibly clear, while the more reflective glass of the stories above emphasizes the building’s connection with the diagonally adjacent One World Trade Center. Sky Memory, a sculpture by the Japanese artist Kozo Nishino, is composed of lightweight titanium arcs that emerge from the black granite wall and, in a trick of the eye, reads as a full circle. Pure white Thassos marble along the north wall of the lobby stands in contrast to the black granite. 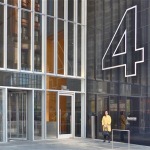 It reappears in the core of the building, where three lobbies lead to a bank of elevators. 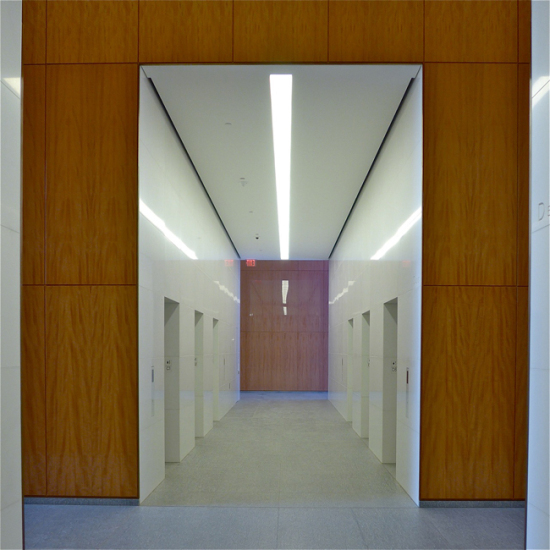 These lobbies are clad in wood panels that were all harvested from a single Anigre tree. 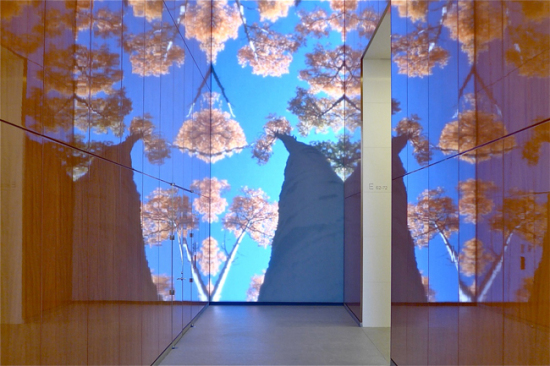 Coated with six layers of polyester and one of polyurethane, the panels reflect scenes of water, trees, and sky depicted in LED screens at the ends of the lobbies. 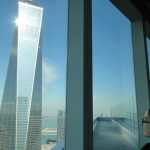 After a quick, ear-popping elevator ride 57 stories up, we disembarked to breathtaking views. As Osamu Sassa, the project architect, pointed out, the notches that accentuate the corners of the building when viewed from a distance also double the number of coveted corner offices available on each floor. After a few minutes of snapping selfies, we reconvened on the terrace formed by the cutout in the building’s facade. One World Trade Center, the tallest building in the United States, did not seem quite as overwhelming from this vantage point. The Pavilion at Brookfield Place, with its grand lobby that we visited on Archtober 12, appeared diminutive by comparison. My bad. I missed the first hour of the tour led by Osamu Sassa and Mary Dietz. Sassa was the project architect for seven years for the many Maki projects in New York. Dietz represented Silverstein Properties. Archtober minions were out in force, so I will cede my blog space to those who actually enjoyed the presentation. Nonetheless, Benjamin and I had a wonderful post-tour conversation with Sassa. 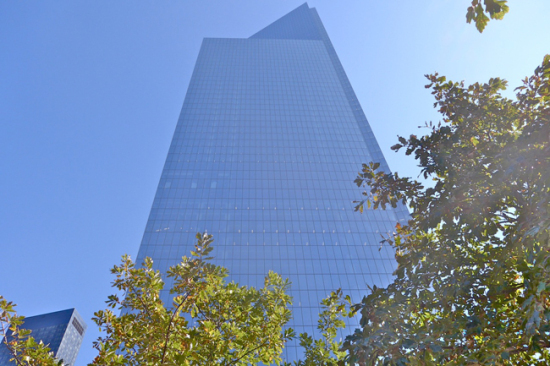 We both noted how much 4 WTC resembles the work of Edward Larrabee Barnes. Sassa had Barnes as a critic at the GSD, and expressed a reverence for him—and shared our sense that his contribution to the tropes of skyscraper design is under-recognized. Julia Cohen is the Archtober Coordinator at the Center for Architecture.